For those who work in libraries it is an unstated fact that shark books are some of the most popular books in the library. Maybe it's the big teeth, maybe it's the size, maybe it's the power of these animals, however you look at it, there is no such thing as too many shark books. 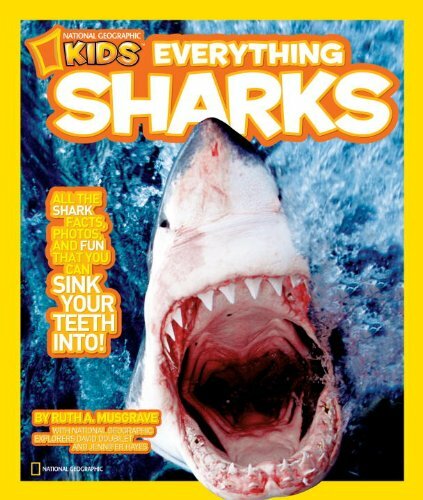 Today, I'm highlighting a new shark book that kids are bound to love. Did you know that sharks can here pray 820 feet away (over 2 football fields) away? Or that sharks can smell blood one-half mile away? or that sharks like the color yellow because it is easy to see under water? These and other fascinating facts about sharks can be found in this book. Maintaining their high standards, National Geographic has produced another book that begs to be shared. Whether the reader shares facts like those above or the gorgeous photographs, the book is perfect for all those shark-lovers out there, and even those who don't particularly care for sharks will find the information interesting. The book would also be very useful in teaching students how to read graphs, diagrams, and maps, as well as the importance of good captions. Highly recommended. Check out other great nonfiction reads at Nonfiction Monday. Today it is being hosted by Telling Kids the Truth. It's been nearly a year since the Gulf Coast Oil Disaster. Unfortunately, for the people, plants, and animals that live along that coast, the disaster is far from over. At best it will take years, even decades, for the ecosystem to even begin to recover. Despite the best efforts of thousands of people, the ecosystems involved will never truly be the same. It is hard to help students understand a disaster of this magnitude. But here are a couple of books that do a decent job of helping students understand what happened. Tony is thrilled to be visiting his cousin Addison for the summer. He especially wants to visit the beach. But his cousin and her family live in Louisiana and the Gulf Coast Oil Spill has forced the closure of the beach. 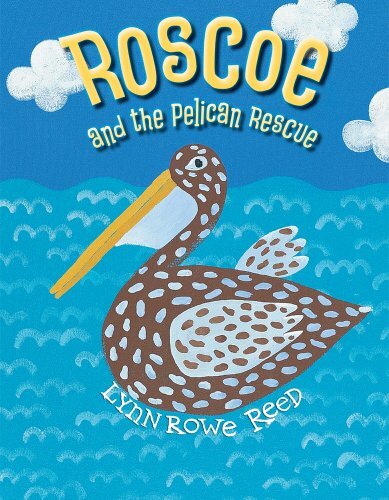 Tony and Addison are horrified when, Roscoe, Addison's dog, finds an oil-covered pelican on the beach. With the help of Addison's parents and a local rescue operation, the pelican's are cleaned and released into an uncontaminated ecosystem. This book gives the reader a glimpse into the devastation caused by the oil spill. The writing does a good job of sounding like a child facing something he/she doesn't really understand. The illustrations also have a very childlike feel to them, which I think, is the point. The book seems like it could have been written and illustrated by a child, giving a child's point-of-view. This book could provide a discussion starter or a good introduction to the more detailed book that I review below. Landau presents a pretty balanced overview of the disaster. She starts by giving an overview of what caused the disaster. She follows that up by explaining how BP and others worked to stop the leak and clean up the mess. The devastating effects of the spill are presented, the photos in this section are especially powerful. The last chapters discuss what has been done by the thousands of volunteers to help the plants, animals, and people hurt in the disaster. 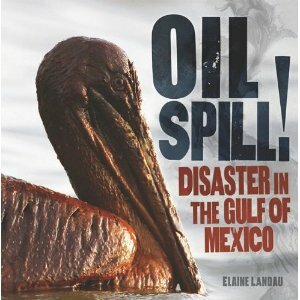 At the end, the author lists several things that children can do to help and a brief history of other major oil spills. The strengths of this book include the clear writing, the diagrams, and most of the photographs. The cover is especially powerful I think. I also appreciated the map which aids the reader in understanding just how big the disaster was/is. The brief history of past oil spills that helps put this disaster in perspective and allows the reader compare this oil spill to others of a similar size. This could also lead to research into recovery strategies. The glossary, source notes, index, and further reading lists are appreciated. The resources listed are mostly age appropriate. The book does have a few weaknesses. First, there is the suggestion that President Obama is the one who came up with the idea of exploring alternative energy sources. Alternative energy sources have been explored for decades and will continue to be long into the future. One of the main problems with alternative energy is the costs involved for the benefit received, but this is mentioned only indirectly. Another problem is that the photographs that were clearly taken under water are confusing, it's hard to tell what is what. More detailed labeling would have helped. All in all the book presents a clearly organized and easy to follow description of the disaster and some of the consequences that all of us will have to live with, most especially the plants, animals, and people who live along the Gulf Coast. April has arrived with blue skies and green grass. Okay, so I'm daydreaming a little bit. It snowed during Spring Break, and when it wasn't snowing it was cloudy or raining. The grass is turning green though. To highlight the seasonal changes that take place this time of year, I will be highlighting fiction and nonfiction books that relate to this planet we call home. This planet we call Earth has many dangers, everything from wild animals to natural disasters to common everyday things that used wrong can be dangerous. 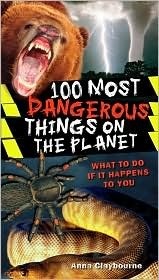 In this book, the author picks 100 things that are especially dangerous to humans. Claybourne starts with natural disasters which seems fitting considering how often such disasters occur, just this last week there were earthquakes, wildfires, and tornadoes wreaking havoc around the world. I appreciate the focus the author has on avoiding the dangers as much as possible. In a lot of cases there are ways to lessen the danger. For example, for a volcanic eruption she recommends following directions when or if evacuation orders are given. After natural disasters, the author covers weather, being lost in the wild, dangerous animals, and dangers we bring on ourselves such as car accidents or parachute failure. Each entry is short but presents the essentials including a brief description of the danger, and quick overview of ways to deal withe the danger. She also gives each danger a risk rating based on how common the danger is, along with a survival rating indicating how likely it is for the victim to survive. This book is perfect for browsing or for reading straight through. The entries are short enough to entice reluctant readers while the topics appeal to avid readers as well. The layout is attractive and easy to navigate. Claybourne has written two other books that are similar, 100 Most Disgusting Things on the Planet and 100 Most Awesome Things on the Planet. Nonfiction Monday is being hosted today by Apple with Many Seeds.